I don't know about you, but these last few nights have been cold for this thin-blooded Santa Barbaran. So I've been filling up on hot comforting soup. "Soooup!" 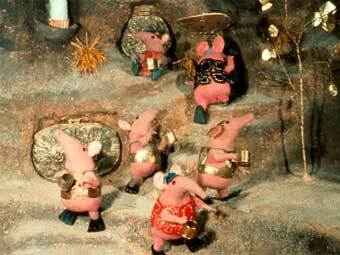 beg the Clangers, holding up their soup mugs, waiting for their soup from the Soup Dragon's soupwells. So this is Itsuki's cha siu ramen, a ginormous bowl for a big solo slurp-fest, or pair it with a few pieces of sushi and it's good to share, like I did. Itsuki's been best for noodles for me, but I hear their curry with pork cutlet's awesome. Anyone have an opinion on this? 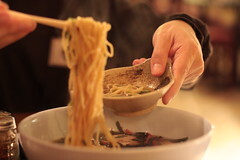 I often stop by Sakura in Paseo Nuevo for ramen on the way home. So good when it's cold out! You are the first person I know who's said *something* about Sakura. I'd actually written them off as "food for the tourists that's better than froyo or a pretzel." I'll keep your words in mind! My partner LOVES the curry pork cutlets. I personally go for the egg donburi. Itsuki has to be our favorite place to eat, but if you feel a cold coming on I say get down to Your Place Thai restaurant for Tom Kah soup. Hey Tristan, thanks for the feedback, especially in support of the curry pork cutlet. Thankfully, my need for soup is because of the cold weather, not because I feel I'm catching a cold (knock on wood). :) Otherwise, yeah, I'd be all over something more hot and spizzzzay!